A yearly favorite flower to view at the Garden on Mother's Day, our tree peonies peak around the last two weeks of April and our herbaceous peonies pop the first and second weeks of May. Reminiscent of bygone days, the peony stays current as new cultivars are introduced. Each cultivar tends to have a short bloom period, but the garden has planted a variety of peony hybrids and species in order to extend the peony season. Natives of Asia, peonies grow either as a deciduous shrub (a ‘tree peony’) or as a perennial herbaceous plant. The Missouri Botanical Garden displays numerous cultivars recognized and prized by peony lovers of all ages. Peonies can be enjoyed in several locations around the Garden but the Chinese and Japanese gardens are home to most of our tree peonies. There is a nice grouping of herbaceous peonies in the Maritz Apple Allee of the Kemper Center for Home Gardening and a magnificent display in Seiwa-En, The Japanese Garden. The planting in Seiwa-En dates from the 1970s, when renowned garden architect Koichi Kawana sought to introduce a contrasting element to the starkness of the dry landscape across the path. Most flowers are pinks and whites with the occasional red. 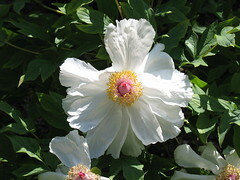 A tree peony species is Paeonia suffruticosa, a native to China, Tibet, and Bhutan. Cultivars of P. suffruticosa have been bred for a range of colors, including red, pink, purple, white and yellow, and bloom between the last two weeks of April and the first week of May. Perhaps the most interestingly named cultivar of peony – maybe the most uniquely named cultivar of all plants – is ‘Furnace for Making Pills of Immortality,’ which can be found in the Hosta Walk. Another example of tree peony, Paeonia delavayi var. lutea 'Hesperus,' can be found blooming the first week of May in the Apple Allee leading to the Kemper Center for Home Gardening. The fluffy single bloom of ‘Hesperus’ is rose-pink with an aura of white. The herbaceous peonies tend to stay smaller, but will yield beautiful flowers year after year. A unique specimen is the fernleaf peony, Paeonia tenuifolia, which has dark red flowers atop silvery, fluffy foliage. This peony is native to Southeastern Europe. A peony with a unique look is Paeonia obovata, which produces white, red, or purple flowers the 2nd week of May in the Cherbonnier English Woodland Garden. Perhaps more interesting are the seed receptacles, which split open when ripe in late summer to reveal shiny black seeds on red stalks. Most familiar peonies are cultivars of the species Paeonia lactiflora. The Garden displays several examples of Landscape Merit Winners from the American Peony Society. The 2009 awardee, 'Coral 'n' Gold,' can be found blooming the second week of May in the Kemper Center Apple Allee. The flowers are large, fragrant and rose-colored with a golden center. 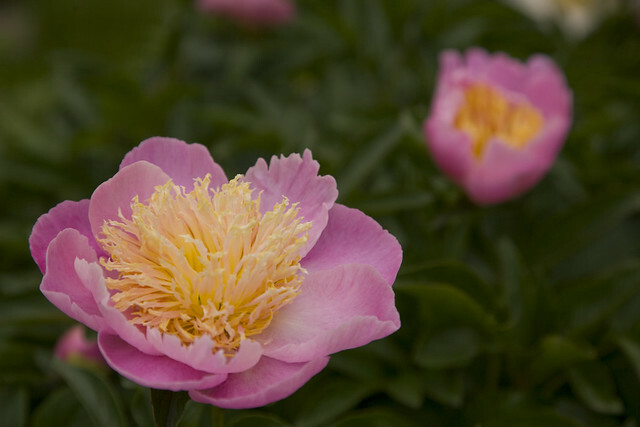 Several other noted peonies can be found in the same area, including the striking red-flowered ‘America,’ and ‘Pink Hawaiian Coral’ and ‘Coral Sunset,’ both vibrant pink and double-petaled, and the white peony 'Duchesse de Nemours.' Nearly 20 different cultivars of herbaceous peonies are present in the Apple Allee, so something should be in bloom through the first three weeks of May.